Aerospace engineers believe they can reduce fuel consumption by embedding an aircraft’s engines into the boundary layer to ingesting the boundary layer air flow. One way to do that is to create new aircraft engine designs. Engineers at NASA’s Glenn Research Center in Cleveland are testing a new fan and inlet design, commonly called a propulsor, which could increase fuel efficiency by four to eight percent more than the advanced engine designs airlines are beginning to use. To address these challenges, NASA Glenn is testing a new propulsor in its 8’ x 6’ Transonic Wind Tunnel. 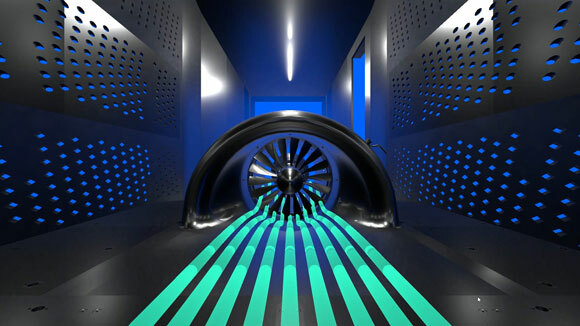 Designed by United Technologies Research Center with research conducted by Virginia Polytechnic and State University, the rugged boundary layer ingesting (BLI) inlet-fan combination is the first of its kind ever to be tested. Be the first to comment on "NASA Runs First-Ever Test of New “Propulsor” Jet Engine Tech"